By problem, I mean I can't stop buying them. It's an addiction, and the first step is admitting that you have a problem so here I am. My newest and "favoritest" cards came out of retail packs today from Target. 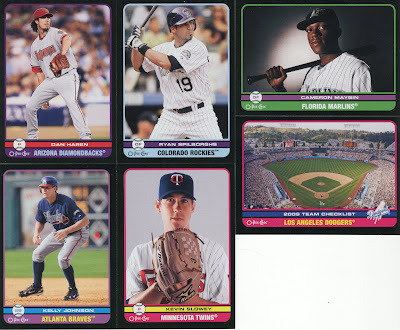 Yes, I did end up with 2 Ryan Doumit black parallels, and they were both in the same blaster. I also got my first hobby box of the year in the mail today and plan to break that bad boy tomorrow once I am done with this class. I love vintage type stuff, so I really don't care about the ripped off design or anything like that. 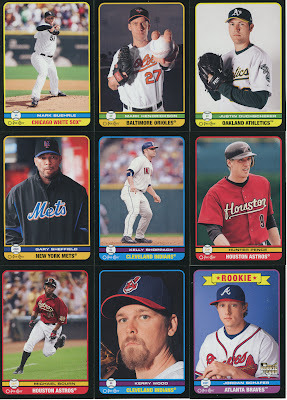 Everything that has come out in recent years is a rip off of something from years ago (meaning retro type sets). I plan on logging in all my cards this weekend this way I can see how many out of the 660 I have so far. The guys I collect will be living in their binders, and luckily I got some doubles of those guys so I can leave one in the set. 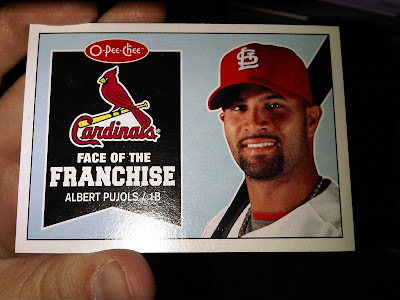 When I used to build sets I used to make sure I had two of all Pujols, and some others this way I could have one in my PC and one in the set. Not sure I see that happening here since I have yet to get a Pujols or Jeter base. On another note, I also want to let the people that I owe cards to know that I will also be doing a mass mailing probably Friday. I apologize for the delay but I haven't really had much time. If you have sent me something, I am sorry for the delayed thanks but I haven't been to my P.O. Box in quite a few days. If anyone is skipping town early tomorrow for the holiday weekend, have a happy and safe 4th of July weekend! The Pujols is nice, but I still like the ARod better. Probably has something to do with a Yanks fan, though. I keep eyeing retail O-Pee-Chee packs at Target... now that I know there's a coupon for the blasters I might pull the trigger. There's nothing crazy about 'em, but they're cheap and fairly nicer than anything else you can buy retail at that price. 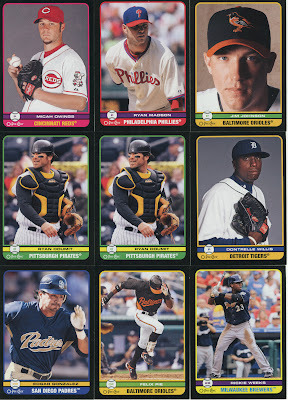 Seeing Edwar Ramirez in this set cracks me up! Cool.... coupons in wax packs. Finally something I can use. I have bought 7 boxes. Yes, SEVEN. 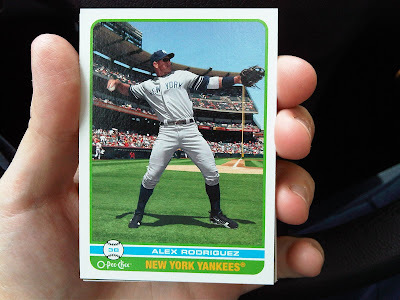 I still don't even have every Yankee card. Edwar Ramirez still escapes me. Oh, and you will find it even more addicting as there are cards, special New York cards that feature Yankees and Mets and their new Stadia. I can't stop. There are special little nuggets all over the place in this set that I can't seem to stop wanting. The hockey inserts are fantastic, what a great way to garner some interest in the sport. Hi, my name is Chris and I am addicted to O-Pee-Chee. I haven't bought a pack in 3 days but I can't seem to stop fondling the cardboard. 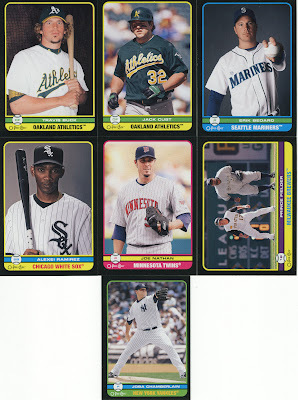 I had no idea there were blaster coupons in the the packs! Does it matter if they're from the gravity feeds or from the retail wax boxes? Oh no, I'm afraid I'm about to embark on the OPC journey too... horrible timing, too with my A&G boxes coming in next week. 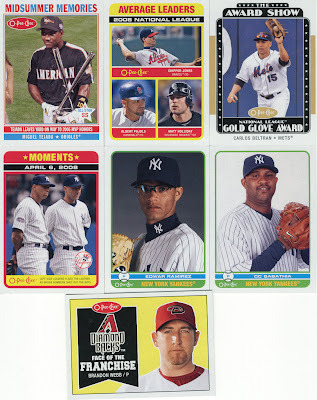 Speaking of A&G - any/all Pujols I pull will be earmarked for you.